A few weeks ago we asked our friends on Facebook and Twitter if they had any questions they wanted to ask us. This was to give us some ideas and some practice asking questions to each other as we are going to start interviewing some lovely cats - Friends of Mog's Togs - on our blog! If you would like your cat to be interviewed as a Friend of Mog's Togs, see the end of the blog. Lila: On balance, it could be worse. Their attentions can sometimes be a bit tedious, especially when it comes to Rachel's flashy camera, stuck right in our faces when we are just trying to snooze, or wash. It's not our fault we're so darn cute... But on the other hand, they do provide good warm laps and I've got them both extremely well trained at not moving all evening while I snooze on them. Personally I actually like that they leave us to our own devices all day, as it means more uninterrupted snoozing time. All in all, I would give Rachel and Pete 6 out of 10. What are your favourite collars? Mia: I loved my Tea and Cakes one, it was so cute, but I lost it after only a couple of days, and it was the last one! I like ones with white backgrounds although I do tend to get them a bit mucky... I kept my personalised collar on for about 6 months! Lila: Rachel says I look pretty in pink, but I'm not really a "pink" kind of girl. I prefer something that says "here comes one classy cat; don't mess with her, and she won't mess with you". I tend to like bright, non-gender specific collars and I'm eyeing up this one "Orange Fizz" for once I manage to shake off my current Love Hearts collar. It's a bit soppy for me. Mia: An ice cream seller! Lila: Head of the European Monetary Fund. Mia: Go Cat for breakfast - I LOVE it but Rachel says it has the nutritional value of cardboard. Rachel's brother would be there and I'd sleep the morning away on his lap. Lunch would be a can of tuna, then more snoozing. About 4pm I'd be ready to play and Pete would dangle the giant fishing rod for a couple of hours, never complaining that his arm aches. Dinner would be poached chicken breast, then a long cuddle on the sofa while we all watch a film. Finally, Rachel and Pete would let us sleep in their room at night instead of shutting us downstairs. Ahh, bliss! Lila: Mia would be in the cattery all day so it would be just me at home. I'd sleep all day and be allowed to come and go as I pleased during the night, and wouldn't be made to the use the litter tray like some kind of domesticated pet. I'd be hand fed all my meals while reclining in the radiator bed. Breakfast would be lightly sauted king prawns, lunch raw scallops, dinner roast duck breast. I'd be allowed in the Forbidden Room and the Forbidden Cupboard Under The Stairs. Finally, Rachel and Pete would let me sleep in their room at night, although Mia would be shut downstairs. Ahh, bliss! Mia: I don't have adventures, I'm too clumsy to do anything very exciting. I don't like to go too far from home in case I can't hear the food bowls being clanged at dinner time! Probably the scariest thing that has happened to me was when I forgot how to get off the garden fence. Rachel had to come outside and bend over so I could jump on her back! Lila: No domestication without sanitation. I demand the right to choose where I poo. Whats the daftest things they have eaten/chewed? Mia: I can't resist a bit of cardboard or newsprint. Rachel puts her muddy walking boots on the local free paper and I love ripping it up into cat confetti. It floats around the bathroom beautifully! Lila: I am very cautious about what I eat, I'll have you know. I lick everything about a hundred times before deciding whether to actually imbibe and as a result I've never eaten anything daft! What advice would they give two cats who are too scared to wear a collar (thus preventing their owner from buying lovely cat things)? Mia: Come on, you silly wusses! Man up! Collars are great once you get used to them. Have you tried taking the bell off? They can be a little scary, and without a bell you can still sneak up on your humans. Rachel won't let us do that, boo. Lila: I recommend a course of psychotherapy, possibly neuro-linguistic programming, hypnotherapy, or even some intensive talking therapy, to help them come to terms with the deep seated causes of this fear. It is usually related to father abandonment issues, which is sadly all too common among felines (just ask Mia, her good-for-nothing ginger father was no use whatsoever to me; of course her father abandonment has manifested itself in perpetual optimism and foolishness, although the latter might be due to me dropping her down the stairs when she was just a few days old, oops). Although some more militant felinists see collars as representative of humankind's desire to show their ownership of us, I don't subscribe to this tosh. They're just pretty things that make us look more awesome than other cats and provide a good way of getting us home when we wander too far. So, did you like getting to know us? If you have any more questions for us then let us know in the comments, perhaps we'll do another interview session soon, this was fun!! Meanwhile, if you'd like us to feature your cat as a Mog's Togs Friend, please have them answer the following questions, and send us the answers along with at least one good quality photo of them to rachel@mogstogs.com (send more photos if you like!). We'll feature them all over the coming weeks and months. Just a quick post to let you all know that personalised cat collars are available until SUNDAY FEBRUARY 12th on our website. We think they are totally fab and love wearing ours! Our friends like theirs too (click to have a closer look). Annie... Jumper... Loki... Pie - aren't they lovely! 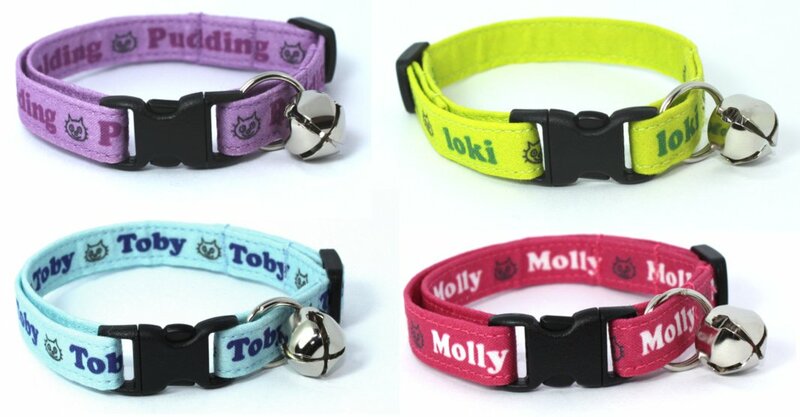 If your cat would like to look as TOTALLY AWESOME as us, all you have to do is go have a look at the personalised collars in our shop, and order by the end of Sunday February 12th. You have to wait a little while before receiving your collars, but we hope to have them posted out to you in the first two weeks of March. As well as our "Classic" style, which comes in blue, pink, purple and lime, Rachel has a new style in stock now as well, with pawprints. This time you can also have a phone number or first line of address printed on the inside. Lovely! One of us (usually Mia...) is just lying down, chilling, when the other one (usually me, I must admit...) comes over and initiates a bit of unwanted physical contact. Usually this involves some face licking (think spit on the hankerchief; well, I am her mother! ), but if that doesn't get the desired response, then the instigator will resort to flicking their tail in the other one's face, and if THAT doesn't work, then the last resort is a quick bat on the head with a paw... This video shows the usual procedure! I veel drink your blood! !